The words could be a decent description for either roller derby or the music scene. In this case, consider it for both. The season opener will showcase singer/songwriter Beth Kille, and in a whole new way for her. The multi-music award winner is typically backed by other musicians, or at least her own guitar. But Saturday night, she’ll perform the National Anthem, “a capella,” as the dictionary defines it, “without instrumental accompaniment.” And though a tad nervous, the opportunity is too good to pass up. One of those rollers, who also happens to cross to the rocker side of things is Victoria Echeverria, the lead singer and guitarist for the band Venus in Furs. Its brand of surf-punk aids in her sleek transformation between Vic the rock star, and her alter-ego derby star, Elle Machete. (Writers note: I must offer a disclosure here. I provided media training for the newest derby members a few years ago. It’s when I learned every woman has a performance name for their time on the track. Most told me they picked something representative of an interest, profession, nickname, or something silly they thought their supporters would enjoy. 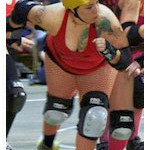 Elle Machete’s been part of the league for more than six years, and though I’ve never had the opportunity to directly ask what it means, she is a pivot player and blocker for her team, the Unholy Rollers.) Echeverria believes these opportunities are special and Kille takes the idea even further. 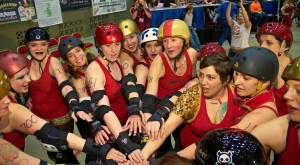 “Both organizations– the derby, and the rock camps– do a lot to empower women. For myself, just doing this gig is a great opportunity to bring attention to both, along with hopefully gaining a few new fans for myself as a performer,” says Kille. Meantime, expect music to be a main-stay at the derby this season. “We’ll warm up to music, we’ll play to music, we’ll party to music. Quite frankly, roller derby wouldn’t be the same without the support and motivation we are getting from Madison’s local musicians. This arrangement is perfect symbiosis,” Obst explains. And a perfect blend of the fast, tough, and physical. Sounds like a perfect night of entertainment to me. Mad Rollin’ Dolls and Musicians as scheduled for this season, below.